The plot in Ultima VIII - Pagan is probably one of the best. It features a desperate attempt of trying to escape the Guardian's world, after having been banished there by the Guardian. With few allies, the Avatar must make his way through numerous trials in order to learn the magic of the four elemental titans and finally overthrow them to use their power to form a Black Gate that can take him away from the world of Pagan. Auric's Ultima Moongates have a brief explanation of what the Avatar's adventure in Pagan is all about. Terilem Dragon's Ultima Webpage contains a more detailed explanation of the Ultima 8 plot (Internet Archive). Prescient Dragon's Complete Guide to Ultima 8 features a very good introduction to Ultima 8. The Dragon's Ultima Page features a brief plot (Internet Archive) explaining the situation and the technical comparisons to older Ultimas. Gamespot: The Ultima Legacy has a plot (Internet Archive) among its summary of Ultima 8 and its comparison to the rest of the series. MobyGames has the plot and description of Ultima 8. At "CRPG History Abridged - 21 RPGs that brought something new to the table", by Felipe Pepe for Gamasutra (25th June 2015). The above listed links are external, and thus I hold no power over their content. Be warned that there may be mistakes in the plots at the above links. Gone is the inability to enter water, as well as the necessity to eat. The Avatar now is totally alone, but is capable of jumping and climbing. This game features numerous trials over water, in which a fall would be fatal. Many people complained that this game required too much saving and reloading because of various attempts required to overcome each obstacle, so a patch was issued to allow the player to enjoy the plot more. For more modern operating systems, DOSBox and Pentagram are both reliable ways to run Ultima 8 on several different operating systems. If you buy Ultima 8 from gog.com, it comes bundled with DOSBox. The Complete Guide to Ultima VIII - Pagan, part of Prescient Dragon's Hint Network, features probably the best and most complete guide to Ultima 8. Pentology: Ultima VIII Cluebook (Internet Archive), originally hosted by Kravlor Dragon, contains information from the Ultima 8 Cluebook. The Other Codex: Ultima VIII - Pagan, part of The Other Codex (Internet Archive), contains information about Ultima 8 as well as links to more info. Ganesh's Bootstrike features a few pages dedicated to Ultima 8. Kobra Kai's site contains a guide full of interesting and fun things to do and discover in Ultima 8. Information on the various schools of magic can be found in this guide, via the links in the U8 Magic section on the right. My journal has some brief notes on magical spells. 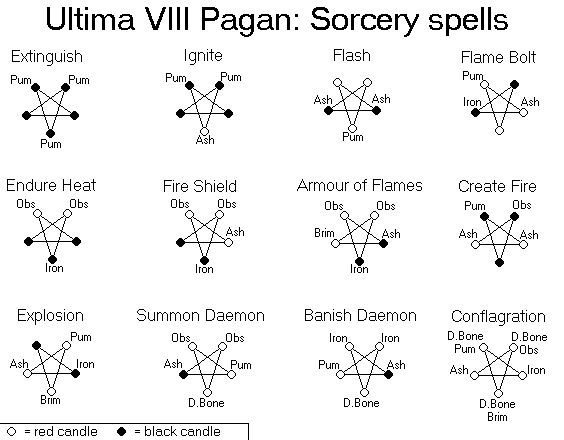 The magic section of Pentology: Ultima 8 Cluebook is very detailed, and explains how to compose spells, as well as explaining effects and reagents. Prescient Dragon's Complete Guide to Ultima VIII - Pagan has a page dedicated to magic which is very detailed and includes pictures, but Sorcery is kept separately. Find the sorcery spells [PNG] at Arthuris Dragon's Ultima Maps and Tables. On the subject of music, the answers to Evil_Freak Dragon's quiz (number 5 to be specific) mention that the music of the Shrine of the Ancient Ones seems to be a modified version of the Kotl theme of The Savage Empire. The Ultima VIII Graphics and Pictures on the Ultima Web Archive include the Lost Vale screenshots [ZIP] (which are also available in a gallery on Dino's Guide to Ultima VIII - Pagan), and also some endgame pictures as well as the Ultima VIII title. There are 52 Ultima VIII screenshots on the World of Ultima. There are 23 screenshots at Mobygames. There is a program you can use to take your own screenshots at World of Ultima's Files. I haven't tried it myself. The opening page for the Guardian Trilogy at the Ultima Web Archive has a small picture of the box cover. You can find a picture of the box cover of every Ultima 8 release at the Ultima 8 Collectibles page at Underworld Dragon's Notable Ultima. Check out a picture with the box, diskettes, manuals and all at the Ultima 8 page of The Legacy. Thanks Hacki for pointing it out. The picture of the Avatar in trouble (Internet Archive) shows two Vardions, among other beasts and people. The Avatar has his back to the wall and is in big trouble. The picture of the Great Pentagram (Internet Archive), if you notice, has all five Acolytes around it. If you think about it, the summoning of Pyros happened after either Bane or Vardion was killed and the Avatar took her/his place. A gallery of Ultima 8 ad proofs at The Ultima Codex. An interview with Jason Ely at The Ultima Codex. An interview with Mike McShaffry at The Ultima Codex.